Apple iPad Air 2 64GB, Wi-Fi Cellular (Unlocked), 9.7in - Space Gray. Condition is Used. Shipped with USPS Priority Mail. New ListingApple iPad Air 2 16GB, Wi-Fi, 9.7in - silver Please read. Point of sale use. This is the exact iPad you will be getting. The serial number on the iPad in the setting will match the one you will be getting. This device screen is fully functional but it has a weak battery. Price has been lowered for minor issue. 4.5 out of 5 stars - Apple iPad Air 2 16GB, Wi-Fi, 9.7in - silver Please read. Point of sale use. 163 product ratings163 product ratings - Apple iPad Air 2 16GB, Wi-Fi, 9.7in - silver Please read. Point of sale use. Trending at $171.49eBay determines this price through a machine learned model of the product's sale prices within the last 90 days. Fully functional Apple iPad Air 2 64GB. Wi-Fi Cellular, model A1567. The housing has no nicks or dings. Screen has a scratch just above the viewing area. Carrier unlocked with clean ESN. iCloud unlocked. Overall,I rate this iPad is Fair Condition,6.5/10. iPad only! Trending at $164.99eBay determines this price through a machine learned model of the product's sale prices within the last 90 days. Fully functional Apple iPad Air 2 128GB. Wi-Fi Cellular, model A1567. The housing has no nicks or dings. White front, sliver back. Carrier unlocked with clean ESN. iCloud unlocked. -power turns on. Trending at $287.35eBay determines this price through a machine learned model of the product's sale prices within the last 90 days. Apple iPad air 2 with 128gb storage. Screen is flawless as there was a screen protector on it until this morning. There are 2 very small marks on the edge- one rub mark by the speaker and a very small nick by the power button. Apple iPad Air 2 - 16GB Tablet, Wi-Fi, 6th Gen - 9.7in - Space Gray - MGL12LL/A. Work and play faster, thinner, and lighter with the space gray 16GB iPad Air 2 from Apple. It's also 18% thinner at 0.24" and weighs 0.96 lb. New ListingApple iPad Air 2 128GB, Wi-Fi, 9.7in - Gold - Excellent! - w/Otterbox! This is a gently used Apple iPad Air 2 in Gold with 128G and Wi-Fi. 5 out of 5 stars - Apple iPad Air 2 128GB, Wi-Fi, 9.7in - Gold - Excellent! - w/Otterbox! 105 product ratings105 product ratings - Apple iPad Air 2 128GB, Wi-Fi, 9.7in - Gold - Excellent! - w/Otterbox! Apple iPad Air 2 64GB, Wi-Fi, 9.7in - Gold (CA). Condition is Used. No issues or scratches. Comes with box and charging cable/plug. Trending at $289.85eBay determines this price through a machine learned model of the product's sale prices within the last 90 days. IPad Air 2. - Original box and manual. 6 MONTHS WARRANTY! THIS IS SLIGHTLY CRACKED -- SEE ALL PICTURES. This does not affect the performance. It is 100% working. THIS IS NOT ICLOUD LOCKED. This is a Space Gray unit w/ 32GB of RAM, Wi-Fi Version. The unit is in good working condition, however the screen is beginning to shadow/darken around the edge(s). You can use as-is, repair or use for parts. Trending at $184.99eBay determines this price through a machine learned model of the product's sale prices within the last 90 days. Apple iPad Air 2 32GB, Wi-Fi, 9.7in Excellent Condition. Condition is Manufacturer refurbished. Shipped with USPS Priority Mail. Trending at $209.00eBay determines this price through a machine learned model of the product's sale prices within the last 90 days. IPad Air 2nd generation Space Gray. Great condition. Trending at $249.99eBay determines this price through a machine learned model of the product's sale prices within the last 90 days. ((STILL HAS PLASIC ON SCREEN)) . THIS IPAD IS CARRIER ((UNLOCKED)). THIS IPAD IS ((WIFI CELLULAR)). THIS IPAD WORKS FLAWLESS AS IT SHOULD. IPAD STILL HAS PLASTIC ON THE SCREEN AND IS IN ((NEAR-MINT CONDITION)) WITH NO KNOWN ISSUES AND VERY MINIMAL TO ((ONE NOTICEABLE SPOT ON BACK SHOWN UP CLOSE IN PICTURE)) VISIBLE SCRATCHES, SCUFFS, AND/OR DENTS AS SHOWN IN PICTURES. Refurbished Apple iPad Air 2 16GB Wifi Space Gray (Good Condition). 5 out of 5 stars - Refurbished Apple iPad Air 2 16GB Wifi Space Gray (Good Condition). 3 product ratings3 product ratings - Refurbished Apple iPad Air 2 16GB Wifi Space Gray (Good Condition). Apple iPad Air 2 64GB, Wi-Fi, 9.7in - Space Gray (CA) - Mint! Still wrapped in original plastic wrapping! iPad comes with original charger and packed in all original packing material as it came from Apple. The charging cable is the only thing missing from the box. Appears that the box was opened just for the cable. Fast shipping with USPS Priority Mail. Adult owned and carefully cared for - scratches or dents. Because the auxiliaries have never been opened this makes fora great present. Trending at $172.99eBay determines this price through a machine learned model of the product's sale prices within the last 90 days. Apple iPad Air 2 32GB, Wi-Fi, 9.7in - Silver. Condition is Used. Always used in case. Fully functional. Normal wear/tear of 2 years of light use. No major dents or scratches. Comes with original box, power brick and usb cable. See pictures closely. Apple iPad Air 2 64GB, Wi-Fi, 9.7in - Silver. iPad is in great condition, no scratches, dents or screen defects and works with no issues. Includes original box and charger. 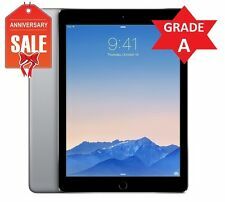 Apple iPad Air 2 128GB, Wi-Fi Cellular (AT&T), 9.7in - Space Gray. Condition is Used. Condition is Used. Apple iPad Air 2 - 16GB. iPad Air 2 A1566. Head phone jack works: Yes. Blue tooth works: Yes. Microphone: fully functional. Speaker: works. Wifi works: Yes. Apple iPad Air 2 128GB, Wi-Fi Cellular (Unlocked), 9.7in - Silver (CA). Condition is Used. Shipped with USPS Priority Mail. Apple iPad Air 2 Silver (64GB, Wi-Fi + 4G) ~ MH2N2LL/A / A1567 NiCE!! The Apple iPad 5, also known as the iPad Air 2, was introduced in 2014. The iPad 5 is the same size as the original iPad Air, but it comes with the power of an iPad Pro. Browse this collection on eBay to find your next 5th generation iPad in a variety of affordable options. What features are available on the iPad 5? This iPad 5 has a full aluminum back case. It is the same width and height as the previous generation. This device is slightly lighter than the iPad Air. This device has a 9.7-inch screen with 1536 x 2048 pixels for a high-definition display. The touchscreen is LED backlit with a sharp image of 16M colors. The Apple personal assistant, Siri, is a feature on this model. The Touch ID fingerprint sensor is embedded in the home button area. This allows the user to unlock the iPad with personalized biometric identification. The device comes with a lightning power connector. The speakers and microphone are located on the bottom of the iPad. Some other features of this iPad include iCloud service, MP3 and WAV player, MP4 player, photo and video editor, and document editor as well. The iPad 5 battery can last up to 10 hours on a single charge. What color options are available for the iPad 5th generation? What gigabyte (GB) options are available for iPad 5? This iPad model has several devices with varying storage options. You can decide which model will work best for your needs. What are the iPad 5 camera specifications? The iPad 5 has a front-facing HD camera that can be used for FaceTime and facial recognition. The camera also has a 1.2-megapixel sensor with an f/2.2 aperture. This camera can record video in 720p. The iPad rear camera has an 8-megapixel sensor with an f/2.2 aperture. The camera has a little more power than the front camera as it can record video at 1080p. Some other camera features include built-in video stabilization to help handheld shots and auto-focus at several shutter rates.